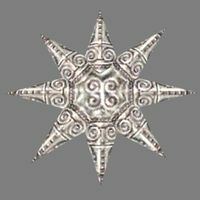 Azura's Star is a boon given to a champion by the goddess Azura. A reusable soul gem, Azura's Star is filled with a soul and emptied thereof by the usual method. It can be reused an unlimited number of times; however, it still says "You failed to make an enchanted item" and then "Your soul gem broke" when you fail enchanting. To acquire it, find the Shrine of Azura on the southeast shore of Vvardenfell (its location is shown on the game map). See Azura's Quest for more information. The gold value of Azura's Star is equal to 5,000 times the point value of the soul. This makes Azura's Star combined with a large soul, the largest value item in the game. Specifically, the largest soul is 1500 points giving a maximum value of 7,500,000 gold. Azura's Star may be taken away from you during various quests that require you to find soulgems. If this happens you will lose it permanently, and you will not be able to get it back (even by pickpocketing or killing the person who took it). To be safe, you should avoid having Azura's Star in your inventory during any quests involving soulgems. There is another "Azura's Star" listed in the Construction Set, ID: azura_star_unique. This one is not a soul gem, but a throwing weapon instead. This version is a unique item never seen in-game, with a 1-5 damage rating and no enchantment. Azura's Star is the only soul gem that can capture the souls of Vivec and Almalexia (in Tribunal). Azura's Star also appears in Daggerfall, Oblivion, and Skyrim with the same properties.